LG has not launched an Android Wear device since the troubled LG Watch Urbane 2, but it appears to be prepping one now. A mysterious new LG watch has passed through the FCC with support for cellular connectivity. LG has requested confidentiality for the external device photos (of course), but there are a few details available in the reports. The device has model number LG-W280, as well as several variants like W280A and W280V. If I had to speculate, I'd say those are AT&T and Verizon-branded versions of the watch, which does have mobile data. The FCC tested 2G, 3G, and LTE on the W280. Perhaps the standard one will be WiFi and Bluetooth only. We don't even get an outline of the device showing where the FCC ID label goes. These days, e-labels are allowed in the software instead of on the device. 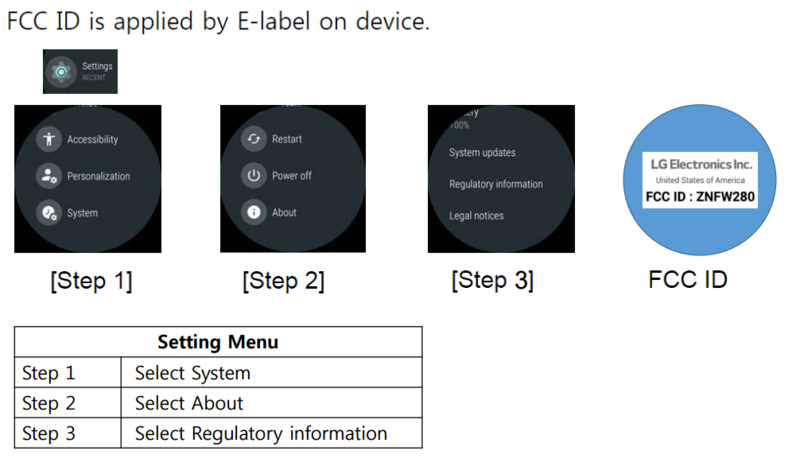 That's what LG is doing with the watch, so we just get the above menu flow to show the location of the label. I guess that confirms the watch is round, as if that was ever in doubt. With Google releasing Wear 2.0 in early February, we might see this device in the not too distant future.